Today was the turn of the latest F1 team to launch their 2011 car. Virgin Racing, now officially named with Marussia, the Russian sports car maker and major sponsor in the title, unveiled their new car at the BBC television centre. I really like the shape of the new car over the previous one. The nose last year was quite unique in that it was very slim at the tip, similar to the one Red Bull started with in 2009 before they changed it later on in the season. The new nose is very reminiscent of most of the other cars on the grid, and it’s clear that they were trying to incorporate everything they could from the leading cars to try and gain ground on their rivals. You wouldn’t expect anything less in F1. Like the other 2011 cars we’ve seen, gone is the long engine cover stretching back to the rear wing, and in its place is a still nicely shaped but smaller version. 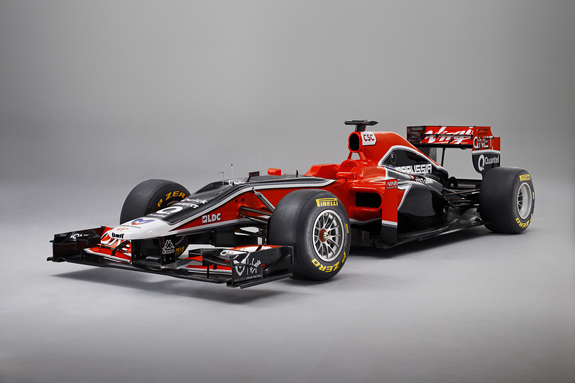 Also gone is the tribal style livery that the team started with in 2010. Although, it’s probably been replaced on the car for most of last season as well, when sponsor additions called for livery changes. I think it looks nicer and cleaner anyway. Other changes aren’t as obvious but I’m sure the car will be much stronger this year. Whether they will still be fighting with Lotus or not remains to be seen. I very much hope they’ll be with the tail end of the main pack as opposed to stuck battling HRT for this season. I think Lotus are likely to make big progress due to their more aggressive car design, Renault engines and Red Bull gearboxes. I hope Virgin can keep up with them but it’s going to be difficult unless they’ve made significant performance improvements with aero and in its use of the Cosworth engine. I’m going to be rooting for all the smaller teams and hoping they all claw their way into contention for points this season.